NEW YORK (AP) The news about Kawhi Leonard was bad, though at least there’s some consolation for the San Antonio Spurs. The way LaMarcus Aldridge is playing, they might be able to hang on until their other star forward gets back. Aldridge scored 34 points and the Spurs responded to the latest absence of Leonard by beating the Brooklyn Nets 100-95 on Wednesday night. ”We didn’t feel he was ready. His confidence level wasn’t there, so we decided to give it some more time,” Popovich said. They were fine without him Wednesday, thanks also to Patty Mills’ seven 3-pointers and 25 points, and Pau Gasol’s 13 points, 12 rebounds and seven assists. Mills combined with Aldridge on the most important moment of the game, a three-point play for Aldridge with 53 seconds remaining on a pass from the reserve guard after the Nets had cut a 17-point deficit to three. Allen Crabbe scored 20 points and Joe Harris had 18 for the Nets, who lost their third straight. 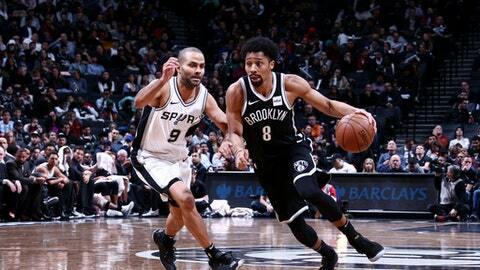 ”Obviously they get the ball to Aldridge and Gasol and then they obviously make plays to their shooters off the post-up actions, and Patty Mills had a great day today as well,” Nets point guard Spencer Dinwiddie said. Mills went 5 for 5 off the bench in the first half, all 3-pointers, and finished with the most 3-pointers by a Spurs player this season. Spurs: San Antonio was also without Manu Ginobili because of a bruised right thigh. … Ginobili and Davis Bertans had shared the Spurs’ high of six 3-pointers in a game this season. Nets: Brooklyn has lost five straight at home. … The Nets have dropped the last six meetings. Leonard has played in just nine games after missing the beginning of the season because of right quadriceps tendinopathy. He also was sidelined briefly because of a shoulder injury. Popovich said Leonard hadn’t sustained another injury, but also didn’t seem confident in his ability to play at the level that had him finishing third in the voting for NBA MVP last season. Dinwiddie shot 3 for 13 from the field and is 9 for 43 in the last three games. Spurs: Visit Toronto on Friday night. Nets: Host Miami on Friday night.